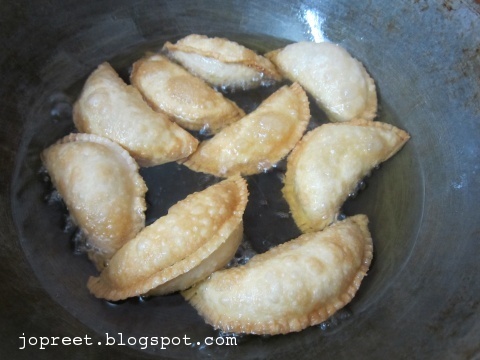 Gujia / Somaas is a sweet dumpling made with maida and filled with nuts or coconut or khoya. It can be filled with any combinations of these. I have used gujia maker to get the shape of gujia. 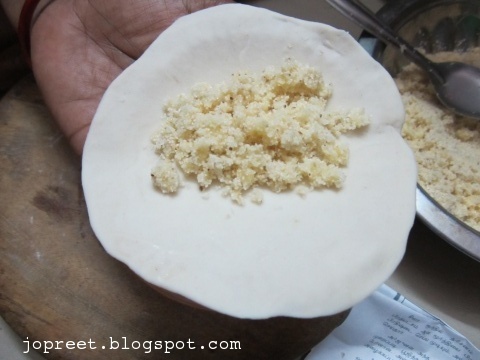 Those who doesn’t have gujia maker, can manually fold the gujia and smear the edges as we do in case of samosa. For healthy version, try this Wheat & Millet Gujia. Roast rava with 1 tbsp ghee till nice aroma comes. Remove from the heat and allow to cool. 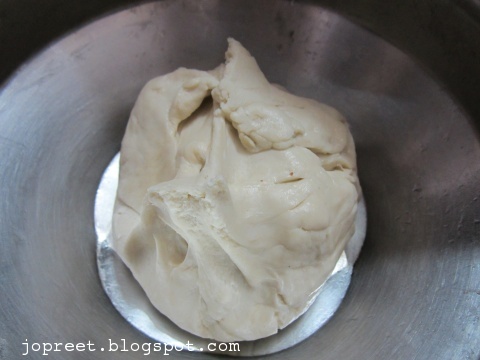 Combine maida and salt in a mixing bowl and knead to smooth dough adding enough water. Cover it and Keep aside. Grind gram dal and cardamom. Grind again with roasted rava for few seconds. 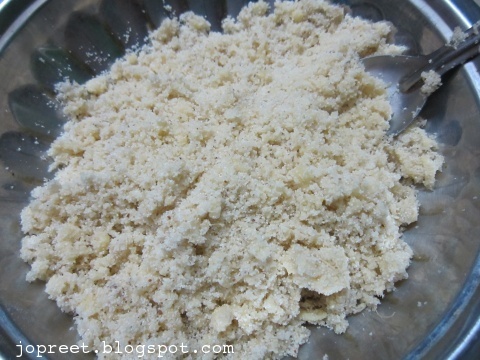 Combine this with grated coconut, powdered sugar and crumbled khoya. Mix well. 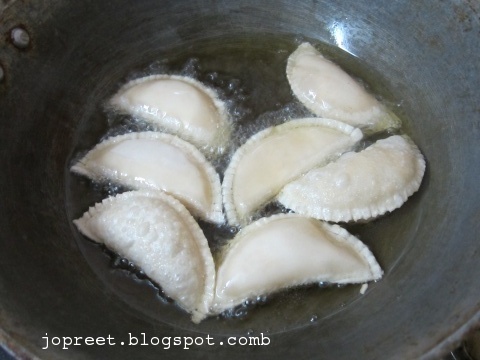 Make small lemon sized balls of the maida dough. Take a ball and roll into poori. Grease gujia maker with oil. 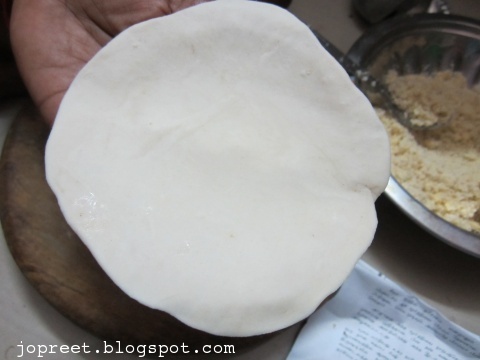 Place this poori on gujia maker and fill with 1-2 tbsp of filling mixture. 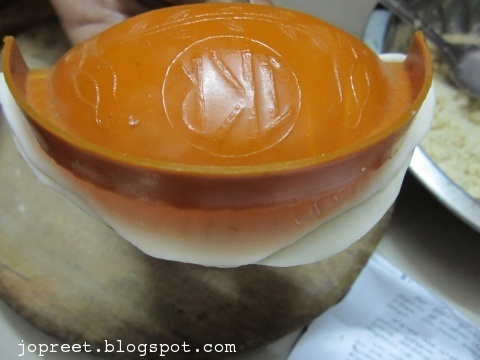 Just press the edges with the edges of gujia maker and close it tightly. 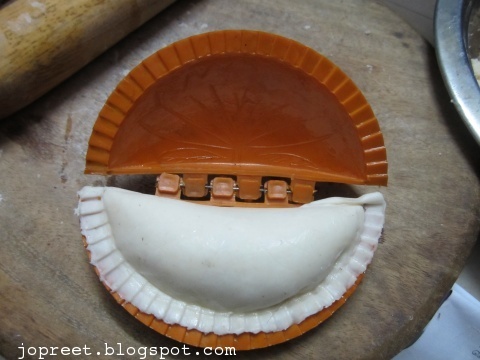 Remove the extra dough from the gujia maker and open it. 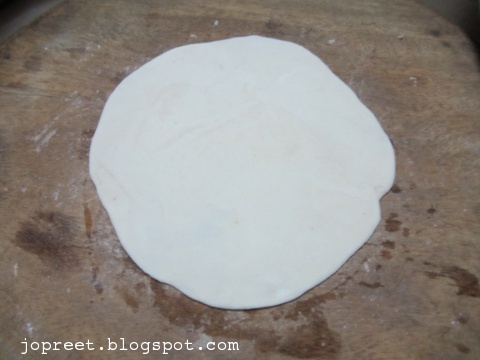 Remove the gujia carefully and keep it over paper or polythene sheet. Similarly, roll all the balls and prepare gujia using gujia maker. But grease the gujia maker with oil once after each gujia. 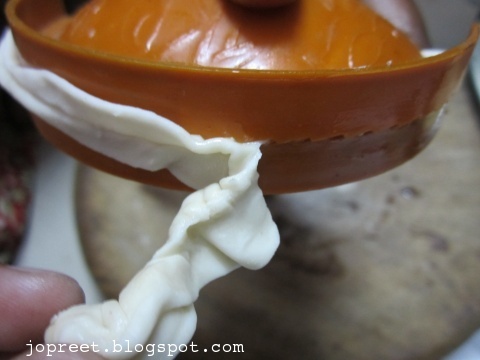 It makes easy to remove the gujia from the gujia maker. Heat oil in a heavy bottomed kadai and drop the gujia carefully in oil. Fry 6-7 pieces at a time till it turns golden brown. Remove from the heat and drain the excess oil using absorbent paper. Store them in an air-tight container and serve it. u r tempting 🙂 i am in vratham! they have come out well Preethi! perfect. You did very well, beautiful click. Super crispy and perfect snack dear 🙂 I have always thought of making this but forget it..loved it dear!! Marvellous crispy beauties, wish i get some. Shud we put in air tight container soon after oil is drained or shud we wait to cool. Will it be crispy. let it come at room temperature and then store it.